In any early stage startup, it’s not uncommon for a seemingly simple manual weekly task to balloon into a major burden. But attempting to automate that non-critical process too early can be a distraction in itself from the business of growing your company, bringing its own set of problems. Let’s use Lexoo (a smart marketplace for finding great lawyers) as an example from our portfolio. Today they have over 900 lawyers on their sophisticated AI powered platform, but they started out with just a contact form. Behind this basic form was a small team, a manual process and a lot of time and energy - but it is what ultimately allowed Lexoo to validate and refine a compelling solution that fit their customer needs. So how do you go from a bare bones MVP to an AI powered marketplace? Where should you start, what should you watch out for and when should you automate? Paul Graham famously recommends that Founders do things that don't scale. Time and energy spent seeking the perfect solution for scale just does not work. Part of doing things that don't scale is not attempting to solve everything at once but to instead building just enough product to grow and learn. When Lexoo started out, they manually found and matched appropriate lawyers to incoming work requests. Although this took time, by not even attempting to automate this process from the beginning, Lexoo were able to test their value proposition and ensure that the work went to the right lawyers. Manual processes must be repeatable. Having the discipline to capture lightweight procedure notes in an easy to follow manner allows you to offload work to other individuals whilst maintaining a level of repeatability. As you learn more about the process, these notes can evolve and form the basis of requirements for any future automation. Hiring a smart, pragmatic and hungry intern has allowed many of our early-stage founders to off-load time-consuming work and scale their early operations cost-effectively. Lexoo hired an intern early on, which allowed the founder Daniel to delegate work with known solutions and concentrate on continuing to tackle real problems. Doing things manually keeps your team closer to the problem and your customers. As your product evolves, you will be able to learn and evolve the manual process to suit different customer needs. When you do eventually automate this process, you are more likely to implement a better and more informed solution than if you attempted to tackle the task up front. As the volume of customer enquiries increased for Lexoo, common patterns started to emerge. The nuances of these customer enquiries were only understood with human input, and allowed Lexoo to focus on building out considered solutions to satisfy these collective needs, as opposed to solutions to broad or too narrow to be valuable. 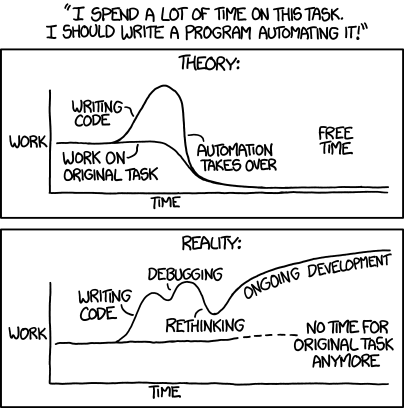 Automation can be considered to varying degrees. Macros in a spreadsheet might take but a few hours to create and in turn pay back in a matter of weeks - but investing months of resource on crafting software that's more elegant is possibly not the smartest choice. Products like Zapier might also be an option, and will allow you to connect SaaS tools with ease in order to automate processes and tasks without writing any code. Automation is not a solution to operational problems, but merely a way to scale and make them faster. That said, before pursuing automation, it is important to acknowledge that software comes with it a set of qualities that can surface a whole heap of other problems. Software is rigid. A human can be flexible whereas an automated process requires the flexibility to be programmed into the system. Software is complex. Building robust and flexible automation adds sophistication to a system, and as business requirements evolve, the evolution of this automation can be time-consuming. Software can break. The same mechanisms that allow automation to bring speed, efficiency and scale, can balloon minor errors into major incidents - incidents a human will likely spot before they become just that. Automating a business process takes precious time away from developing the rest of your product roadmap. When prioritising automation of business processes, it needs to be done as part of your overall product roadmap process to ensure that the company is tackling the most important things first. Oftentimes it makes the most sense to start automating the parts of a manual process where doing it manually adds friction or little/no value to the user journey. The Lexoo tech team chipped away at automating the real problems and provided the right automated solutions that delighted their customers. Over time they created a lawyer portal so that lawyers could manage their own profile, automated document creation, created an AI-powered smart triaging system to recommend lawyers for work, and creating productivity tooling to make working as a lawyer or client with Lexoo a joy. Sometimes your hand will be forced, and you will have to tackle automating the manual process as it has become too inefficient to scale it in its current form. You may not need to scale the whole process, only the time-consuming bottlenecks. Other times, the original assumption that the process should be automated to scale were unfounded and you just saved yourself £000s in software development. Wherever you might land, it’s important to understand that before any automation comes a tonne of hard work - but by committing to manual practices in the short-term, you in turn commit to learning more deeply about the problem, your customers and gain confidence in the solutions you’re trying to build.